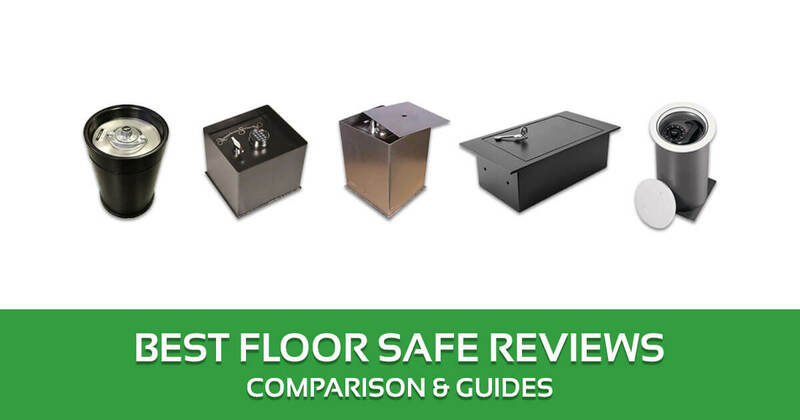 Have you been searching for the best floor safe reviews and not had much luck? Well your search has ended as I have here a review guide of the top floor safes online. The products here are the best that I’ve come across online, but if you’d rather look for one yourself, I have a detailed buyer’s guide. I also explain their benefits and why they’ve become popular. Before I go to the floor safe reviews, I have to explain what these ground safes are, and how they differ from regular safes in terms of security and durability. Gun and depository safes can be anchored on floors, but a floor vault is actually embedded in the concrete floor. They come in different shapes and sizes but being set in the floor is what they all share in common. Like regular safes, you can use floor vaults to store valuables in your house, office or shop. They also come with several features such as sophisticated locking systems, steel doors and so on. 5 What Is Floor Safe? 6 What Is A Floor Safe Made Of? 7 How Does A Floor Safe Work? The best floor gun safe isn’t necessarily the most expensive, but rather one that is constructed well. You’ve probably come across this many times, but it’s worth repeating because apart from the lock, the walls keep the contents safe from burglars and disasters. The walls and door should be solid steel. There is no such thing as too thick a wall or floor for safes. The thicker the steel the heavier the floor vault is, the harder it will be for drills and other mechanical tools to penetrate it. A heavy floor safe can be a pain to install the first time out, but it’s an advantage because it deters burglars. If you’ve got a heavy safe that is cemented to the ground, it’s next to impossible to lift. Heavy safes are those made of steel, and that should always be your primary option. If you’re going to buy a light floor vault, make sure the rest of the components are high quality. A UL approved lock means it is of high quality and will last a long time. Don’t settle for low quality locks because they won’t last or worse, lock you out. If you’re going to buy a safe without a UL approve d lock, make sure it gets good reviews. Some of these safes offer multiple locks, biometrics and other security options. They’re a good option if you’re intent on high level security. A continuously welded jamb is preferable to tack welded because they’re more durable. Most of these vaults are not watertight, so check the internal structure first and if they have some kind of waterproof bag provided. After doing a lot of research, I have narrowed the list of floor vaults to these five. As you’ll see, these safes do have features that set them apart from the rest. Floor gun safe reviews have given the SentrySafe good feedback, and why not as it’s perfect for home and business use. 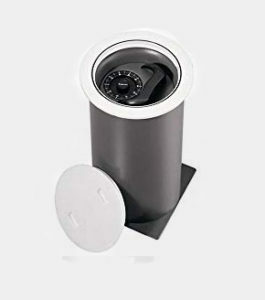 The safe comes with a waterproof bag which you put around the safe before installing. By putting the waterproof bag on, the items are going to be protected from moisture and dampness. There has been a lot of confusion about the waterproof element in the safe. However, a lot of complaints are the result of not using the waterproof bag that came with it. 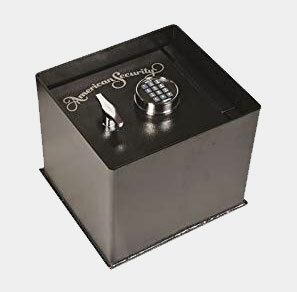 The Sentry Safe is not fire rated, but that doesn’t matter because the concrete you put around it will serve as the shield. With the waterproof bag and sufficient amounts of concrete, the container will be fire and waterproof. The biggest concern will be the installation, but if you know how to work with concrete the process will be straightforward. It is going to take time, but you only have to do it once. The SentrySafe has a one year warranty. Like the other SentrySafe products, this product was thoroughly tested before release. The safe is constructed from 12 gauge thick steel, and it is certified waterproof. The safe also has double locking bolts and a metal cover to secure the items inside it. The SentrySafe uses a four number locking mechanism to secure your valuables. In addition there are double locking bolts built in to deter theft. With interior dimensions of 10 1/2″H x 8 3/32″D, the SentrySafe has lots of room for guns, ammo, books, documents, cash, business records and so on. Compared to standard safes there’s more than enough space here. The SentrySafe waterproof floor safe is well-made and should satisfy the needs of both homeowners and commercial establishments. Any discussion of the best floor safes should include this product, as it is simple but effective. The Barska is a no-frills floor safe, but it has all the essentials like a heavy duty body, anchor holes and plenty of storage space. All the hardware you need to install the floor safe is included for your convenience. The Barska floor safe fits among floorboard joints, and couple that with the pre-drilled holes and installation is relatively straightforward. The safe comes with a floor mat that acts as a cushion for anything you put in it. Compared to those on other floor safes, the Barska floor mat isn’t that thick, saving interior space. The Barska safe is meant to be installed under the floor. Once you’ve installed the safe, it will be level to the ground and you’ll be able to conceal the safe by putting a carpet over it. With 0.22 cubic feet, the Barska allows you to store documents, electronics, money, weapons, and other items. Unlike other safes the Barska is easily concealed from burglars and prying eyes. 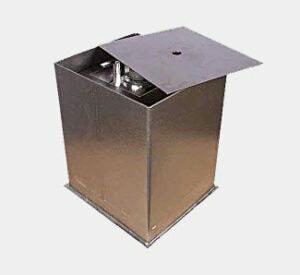 The Barska floor safe is built using thick, solid steel, and there are mounting holes provided for faster installation. The safe also has a couple of dead bolt locking systems for increased protection. Like other Barska products, this is comparable to other in ground safes for sale in terms of quality and security. This is another high quality in floor safe and designed for lifetime use. Heavy set and offering lots of storage, the B1500 is ideal for home use and also for shops. The B1500 manages to combine aesthetics with security. The color and contemporary styling allows it to mix with any interior motif, while the heavy duty lock keeps burglars away. One of the highlights here is the ESL5 electronic lock which safeguards the items you store in it. The keypad illuminates in the dark so you can open the safe under your bed or in a dimly lit area. The AMSEC also has to be installed under the floor for the best results, but it’s not that hard to do like the other safes. Once the safe is in place, there’s no maintenance work needed. The AMSEC safes are known for their longevity and this is no exception, making it ideal for money and other valuables. The safe is equipped with a state of the art lock to prevent theft. An ESL5 electronic locking mechanism ensures the contents are safe inside. The safe measures 11.8 x 14.1 x 12.8 inches, and the interior is roomy enough for money, documents, jewelry and other valuables. These specs are sufficient for home and also for offices or shops. The safe sports a welded design that provides a durable seal and an attractive aesthetic. The benefits of the welding may not be apparent, but actually makes it harder for anyone to open the safe. The AMSEC B1500 is one of the most ideal floor safes for the home as it combines security with durability. The C7 is not just a floor gun safe as it is used to store all kinds of valuables. With its versatile design you can use this at home, restaurants, gas stations and diners, testament to its efficiency. There is a 7-1/4” clearance when you open the safe, and it has a UL Group 2 key lock for enhanced protection. The safe also has a carburized hard plate to keep the lock safe. The lock is changeable and you can also remove the dial. In addition there is a drill proof spindle which acts as a further deterrent against burglary attempts. All the locking bolts used in the safe are heavy duty, and each one comes with a reinforced bolt for re-locking. With these features it is easy to see how the safe functions as a do-it-all repository. The C7 has a C rate door made of 1 ¾ inch steel, and there are 3 bolts securing it. According to AMSEC, shearing is going to require 25,000 lbs. The safe comes with a heavy duty waterproof dust cover that provides additional protection. Once installed underground the safe is protected from dust, water and fire. The safe has an O-ring seal which does not slide or rattle like those found on other dust covers. The rest of the body has also been designed to provide as much protection as possible from burglary attempts. The AMSEC hidden floor safes have always been known for quality and the C7 is the latest example of that. The Hollon is often used as an in floor gun safe, but it is capable of much more as you can store anything in it. You’ll need to install this on the floor for maximum security, and once there only a jackhammer can remove it. The spring loaded relocking feature is essential for security, and the inclusion of an air-spring bar makes it easy to open the door. While the safe is hard to rob, you won’t have trouble with access. One of the most widely used methods for robbing safes is by drilling, so the inclusion of a drill-proof safe hard plate provides extra protection. Even if you have a powerful drill it won’t be able to scratch the body. Since this is a floor safe it’s going to be flush against the floor once installed. This means anyone who tries to burglarize your home has to find the safe first. The safe has a ½ inch thick door and five locking bolts to deter attempts at breaking it open. The rest of the body is powder coated for long lasting finish and it has a full length dead bar installed. The best safes uses a UL listed lock and that’s what the Hollon has. The UL Group 2 lock also has a relocker to prevent any attempts to rob the contents. The safe has interior dimensions of 12 9/10” (H) x 10 9/10” (W) x 11 3/10”(D), so there is there room here for firearms, cash, documents, gadgets and so on. The Hollon hidden floor storage is one of the most dependable safes available today, and it’s for anyone who wants to safeguard important items. 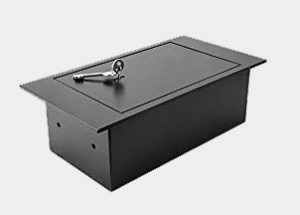 A floor safe is a depository installation that is embedded in the floor for safe storage of valuable commodities to keep them out of danger; be it theft-related cases or even fires. Floor safes are designed in a way that the installation is done into a floor foundation constituted of concrete. The installation of the floor safe may be time-consuming but trust you me it is worth it. This is owing to the fact that the floor safe is made with very firm and durable materials especially the door jambs hence providing the much-needed safety for valuables. What Is A Floor Safe Made Of? The installation process of a floor safe requires crucial tools which range from star drill, concrete, sledgehammer to rebar. The material used to make the floor safe itself is waterproof as well as fireproof. The doors and door jambs are made of high-quality steel materials that are heavy and resistant to inflammation. The concrete mixture is mixed in a way that it holds the safe firmly into the floor making it very difficult for anyone to break through and gain access to the store content. The rebar is used to reinforce the concrete time to time making it harder and harder thus the firmness of the floor safe. How Does A Floor Safe Work? Floor safes should at all times be strategically located in a remote area in your room where there is minimal footwork or rather traffic. The access to the safe is provided by the door that is aligned to the floor. The safe owner will open the safe, secure their valuables and then lock the safe. Most of the locks are designed in a way that the safe owner uses a number combination to open the lock. In addition to the number combination, there are locking bolts that will deter anyone trying to access the safe contents illegally. The floor safes have sufficient space where the owner can store valuables of all kinds from documents, monetary goodies, cozy electronic goods, weapons and fancy ornaments. Most of the floor safes have got illumination which allows you to open the safe even in darkness or even in hidden places for instance under your bed. Floor safes come with hard plates that anyone gaining illegal access cannot drill through. The heavy duty covers that accompany the floor safes are waterproof thus the valuables stored in the safe are free of damage by water or moisture. The color chosen for the safe is done in a way that the floor safe can blend smoothly with the general theme of the house and particularly the floor. The merits of acquiring a floor safe have far much surpassed those that come with using a wall safe. The maintenance of the floor safes is very little as opposed to wall safes that require frequent dusting and additional protection to keep them from rusting. 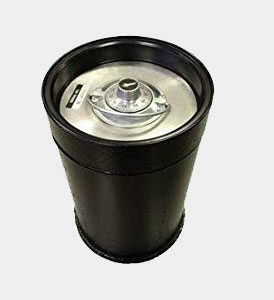 Floor safes have also proved more suitable to deal in as compared to the wall safes. This is simply because the wall safes are easily traceable by any individual who may be intending to steal from the safes. The security details of a floor safe are complemented by the firm concrete built around the safe thus making the safes more equipped to prevent theft when contrasted against the wall safes. Most of the floor safes are more spacious than the wall safes something that can be attributed to the space consumption when installing the safes. Wall safes are installed where they interfere with the owner space, unlike the floor safes. If you read home floor safe reviews you’ll see that floor vaults and safes get a lot of positive feedback, and there are good reasons for this. Secure: determined burglars can hammer at an anchored safe, but removing one that’s embedded in cement floor is way harder. Hidden: once the safe is embedded in the floor, you can put a rug, carpet, or a piece of furniture over it. Because the safe is almost flush to the floor it’s hard to see. Size: The size of the safe you can use is only limited by the depth of your floor. This gives you more flexibility compared to other safes. Enhanced Security: these safes are often used in commercial and business establishments, an indication of how secure they are. Protection from the Elements: your safe is going to receive extra protection from fire because it is surrounded by concrete. In addition there is little risk of impact damage because it is already in the floor. Numerous Options Available: floor safes are as varied as standard safes when it comes to features, so there’s no shortage of choices. Easy to Use: as the products here show, these safes are easy to use. Cheap floor safe reviews show they need a lot of maintenance, but if you buy from a reputable brand it should last a lifetime. Here are some suggestions to optimize their use. Ensure Proper Installation: a large floor safe will take a couple of days to install on a concrete floor. Make sure you know what you’re doing, if not get a professional to help with the process. Follow the Guidelines: reading the manual is an advice you often hear, but it’s never been more necessary than here. Once safe is embedded, you won’t be able to remove it without making a mess. Keep the Location Secret: just because the safe is in the ground doesn’t mean no one will try to remove it. The point of putting the safe there is concealment, so don’t tell anyone except those you trust. Choose a Good Location: if you’re going to install the safe on the floor, make sure that it’s in a location you’ll be able to easily access. In case there’s an emergency and you have to retrieve the contents, it should be within reach. Inspect the Safe: don’t install the safe before inspecting it. How big should the safe be? This is a matter of personal preference. If you’re going to put a lot of stuff in it, make sure the safe is large enough, so take stock of what you’re putting there first. What types of locking mechanism do these safes have? Most of these safes have some form of electronic keypad where you enter the code. Others use dual keys or biometric fingerprint controls. What are the benefits of a floor safe over a regular safe? The biggest advantage of a floor safe is how easy it is to conceal. Once installed on the floor, you can put a carpet or rug over it and no one will know the safe is even there. Do I need professional help installing one of these safes? if you’re into DIY and know how to work with concrete floors, no. Otherwise, yes as the procedure can get complicated. Are all floor safes waterproof? If the floor safe is waterproof it will be stated in the product description. If there is nothing mentioned, assume that it is not. The five floor vaults / safes I have reviewed above are all high quality, but the winner has to be the Hollon B2500 in Ground Safe. It is solidly constructed, heavy and most of all, has a UL listed Group 2 lock. Something other safes don’t have. When it comes to floor safes, you can never be too careful about the type you buy. I hope that by reading the best floor safe reviews here, you’ll be better informed and purchase the most appropriate one for your valuables. Today getting a site with most of the dedicated information about guns and accessories is not a quick task online. I came across this site online while doing some searching I can say I was not disappointed. Today I own the AMSEC C7 In-Floor Safe, thanks to the research and this site was helpful in understanding the models one can opt for.